Better medicine through a team-oriented approach. Our team of veterinarians, technicians and client service representatives is comprised of a group of dedicated, hard-working individuals from varied backgrounds. All share a common goal, their love for animals. Our team members pride themselves on customer service, and they are dedicated to providing your pets with the highest quality health care. Michael “Dr. T” Tokiwa is the owner and Medical Director at The Animal Hospital. A self-proclaimed CanAsian, he graduated from The Atlantic Veterinary College in beautiful Prince Edward Island. His passion has always been to change the landscape of the profession: embracing the latest technologies, medical and management changes that not only help improve the medicine we practice but also help with the quality and lifestyle of the people within the profession. Dr. Tokiwa is also a media personality. As host of the Your Pet Matters Radio show Saturday mornings at 10 AM, he brings the people that treat, train and help your pets into your living rooms. HIs YouTube videos provide a great viewing experience into the lives of those who treat and increase the human-animal bond of our furry legged family members. Outside of work, his interests are varied. Equally permeating his life are the joy of Family, pets, music, and exploring new projects and hobbies. He’s equally at home riding his motorcycle, playing Nerf /Anki/video games with his son, jamming on his drum kit, or jogging with his Golden, Holly. Dr. Bruce grew up in Queens, New York, where she went to Bronx High School of Science. Her first job was at 16 years old at the Bronx Zoo! She received her undergraduate degree from Concordia College in biology. She attended North Carolina State University College of Veterinary Medicine for her DVM. Her veterinary interests include surgery, dentistry, and feline medicine. Outside of work, she likes to travel, travel, travel! She also enjoys fitness, music and spending time with her husband. She has one rescue kittie named Toonces. Dr. Bruce does freely admit that she has a serious shoe obsession! Dr. Charles Schwirck has been part of the Hillsborough and surrounding community for a long time. He is the former owner of Hillsborough Veterinary Hospital, and after Red Bank purchased it, he stayed on as the Medical Director and later as a Recruitment specialist for Compassion First. His passion has always been to be on the clinical side, and we are excited and grateful that he’ll be spending some of his free time with us. Charlie also has a home visit business called Sourland Pet Health. Dr. Gartland is an emergency veterinarian at a 24 referral center in Mount Laurel. We are happy that he provides us with some of his free time at the hospital. Dr. Gartland’s interests outside of veterinary medicine include spending time with his wife Jess (who is also an emergency veterinarian), his Great Dane, Piper and his cat, Domino. Additionally, his hobbies include cooking, traveling, sports, and playing guitar. Ryan Keegan is a board certified veterinary cardiologist. His Mobile Cardiology business services most of the referral and surrounding practices in the area. Dr. Keegan is happy to provide his services managing your pets that have heart disease. As a mobile service, Dr. Keegan comes to our hospitals, performs a full cardiac exam on your pet, and then discusses the case directly with you. He also is skilled at performing cardiac ultrasounds and helps our doctors review chest radiographs, blood pressure reading and ECG’s to get a complete cardiac diagnosis of our cardiac patients. Outside of work, Ryan spends time with his wife, cat and a pack of dogs. 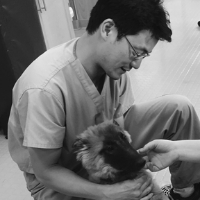 Dennis Ting is a board certified veterinary surgeon. His face is familiar among many of the surround practices in the area. Dennis provides us with orthopedic surgical services as well as difficult or oncology-related soft tissue surgery. As a mobile surgeon, Dr. Ting comes to our practice, meets with you, performs an orthopedic exam on your pet, and determines with you the best surgical options. In addition to orthopedic surgeries, Dr. Ting is skilled in soft tissue surgeries that may be beyond the scope of a general practitioner. These surgeries are also performed on site, under the care of our Doctors and Dr. Ting. Amanda was born and raised in a small town in Long Island, NY and was relocated to New Jersey after Hurricane Sandy. She now goes to Rutgers University with hopes of one day becoming a Veterinarian. At home, she cares for her many animals including her horse Princeton, her 3 dogs Petey, Elvis, and Kluska, and her 2 cats Toulouse and Kippy. In her free time, she enjoys riding horses, playing volleyball and singing. Anna grew up in Plainsboro, New Jersey, and is currently pursuing her undergraduate degree from Rutgers University in Cell Biology and Neuroscience. She has been interested in pursuing veterinary medicine since she was a little girl, and has been a team member at the Hospital since 2016. She is a proponent of One Health and appreciates the role of veterinarians as protectors of both public and animal health. Outside the practice, she is a research assistant at the Cancer Institute of NJ and enjoys practicing calligraphy, spending time with her Golden Retriever, Skye, and anything matcha flavored! Chris Dmytrow has loved pets ever since seeing The Abyss at a young age and falling in love with the rat in the movie. Between that and nursing being a common profession in his family, veterinary nursing was a natural fit. He loves all manner of furry rodents, and his family has had many cats, dogs, rats, hamsters, gerbils, ferrets, guinea pigs, and even sugar gliders as pets over the years. Currently, Chris lives with five rats, a cat, and his wonderful wife. After a long retail and sales career, Chris started studying veterinary nursing at Purdue in 2009. He studied at Purdue for four years, he has three years of work experience through Banfield and Northstar Vets, and he’s currently working at The Animal Hospital of Blawenburg while attending Bergen Community College in Paramus to attain his CVT license. Cyndi is NJ born and raised and has been in the veterinary profession for over 19 years. She is currently a surgery technician with our friends at Animerge and kindly spends some of her free time helping out at our practice. When not working, Cyndi loves to cook, be on the beach, working out at the gym, singing and driving her jeep with her boxer Jamie and cat Chai are her copilots. Diane grew up in and lives in Pennington, NJ. She shares her home with her husband, her two boys, 2 cats, 1 bird and 4 hermit crabs. Diane has been in the veterinary field since 1996. She loves to spend the outdoor adventures with her family camping, biking, kayaking, and is learning to crochet. Emily has always had an affinity for animals since she was a little girl. Growing up on a farm in Ringoes, NJ, Emily has cared for everything from horses to goats to pet rats. Emily currently resides in Branchburg with her 4 cats Charlie, Cricket, Peaches, Maude, and their beloved American Pit Bull Terrier, Bane. In her spare time, Emily volunteers for a local animal shelter and enjoys spending time with her family and friends and photography. Kimberly Sickoria is the head technician at the Animal Hospital. She graduated from the College of Saint Elizabeth in 2010 with a Major in Biology and minored in Chemistry. After teaching high school for one year, she decided that animals were her passion and obtained a degree in Veterinary Technology from Camden County College in 2013. She currently has two pets, Vito a 4-year-old mix breed and a 5-year-old cat named Fredrick. Outside of work, she loves to bake and spend time with her family. Kristen is a senior at Rutgers University majoring in Animal Science on a Pre-veterinary track. She is very active both on and off campus, as a Resident Assistant for first-year students, a senior work-study student on the Rutgers Farm, member of the both the Veterinary Science and Oceanography Club, site leader for Rutgers Alternative Breaks, and of course work at The Animal Hospital at Blawenburg! During her downtime, she enjoys going to the gym and being creative whether it be painting, drawing, or building. Currently, she is in the process of applying to veterinary school and aspires to work with marine mammals!